Celebrate with up to 20 people aboard Capt Nick's forty foot classic, whether family, friends, or business colleagues. Our Miami and Miami Beach Cruises are a great way to relax, celebrate and see Miami from a unique perspective. No other celebration will be as memorable as cruising on a yacht! 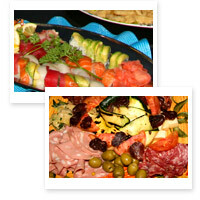 We offer a nice array of gourmet food and beverages, including alcoholic. Reasonably priced, super tasty, and all served by our professional mate. Our yacht charters and catering services are suited for small to midsize groups (certified to fit comfortably up to 20 people), and perfect for any occasion (birthday celebration, bachelorette party, corporate event, or a romantic dinner). Our catering service is provided by Tony Chan's, Daily Creative and Primo's Restaurant, but can be easily customized to our clients' food and dietary needs and preferences. 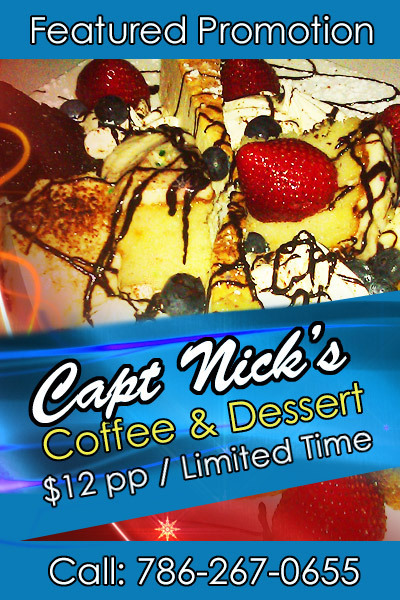 Digital and print menus are available. Copyright © 2011-2015 captnicksmiamicharters.com. All rights reserved.